Spending a day out at sea can be a marvelous way to relax or catch up on quality time with friends. Your yacht may even be an ideal place for an engagement party or your kid’s sweet 16. The only issue is that the bass on your sound system might not hold up against the sound of the sea. For that reason, why not consider installing a subwoofer? With one of these speakers, your sound will be more powerful than ever before and you can host parties your guests will remember for years. Even if you’re simply relaxing, don’t you want to feel the music? We’ll tell you everything you need to know about marine subwoofers and the best ones on the market right now. Maybe you’ll be tempted to take your boat’s sound to the next level. A subwoofer is a speaker that’s capable of handling lower frequencies. As a result, it captures bass and sub bass more dynamically, giving you rounder sound & fuller music experiences. Your audio system is enhanced because many sound systems aren’t able to reproduce such low frequencies, so with a subwoofer, you retain the tonal quality of your music. If you want to hear every beat of your sound system, it’s highly recommended to add a subwoofer. The bass will be deeper which will enhance the atmosphere on your boat. The volume of your subwoofer depends on how high the power rating is. If you’re looking for casual listening, any power rating higher than 100W is suitable. 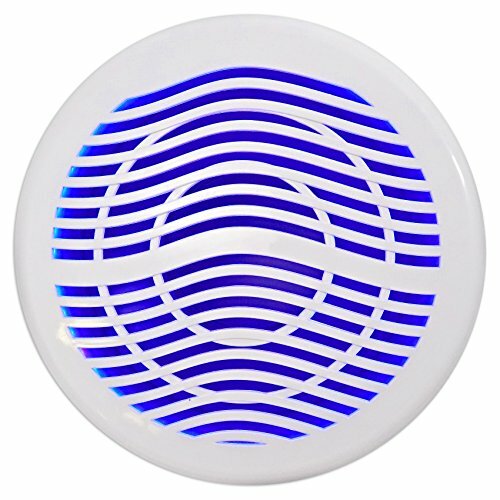 On the other hand, if you’re planning a party or you want music to fill the air around your boat, then it’s preferable to find a system that at least has a rating of 300 – 500W. The higher, the better. To put it simply, impedance refers to how easily electricity passes through the coils in your subwoofer. If the impedance is low, it means your sound will more powerful. An ideal impedance for a subwoofer is four ohms but if you can find one that’s lower it’s even more preferable. If your subwoofer is too heavy it might weigh down the structure that it’s installed on which will damage your boat but if it’s too small it will hamper the sound quality. 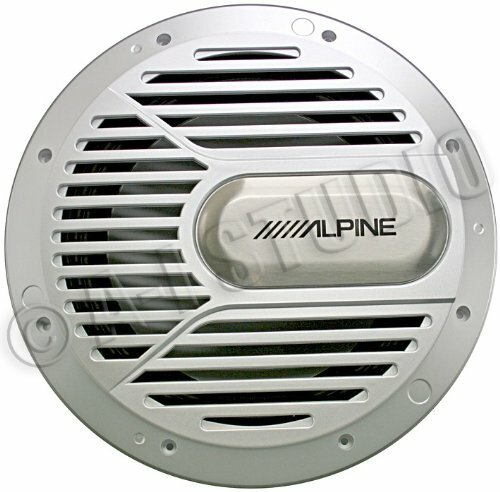 For your boat, a suitable subwoofer should at least be 10” – 12”. This will ensure that it’s light enough but will also produce voluminous sound quality. Even if you install your subwoofer inside your boat, it can still be damaged by moisture in the air. 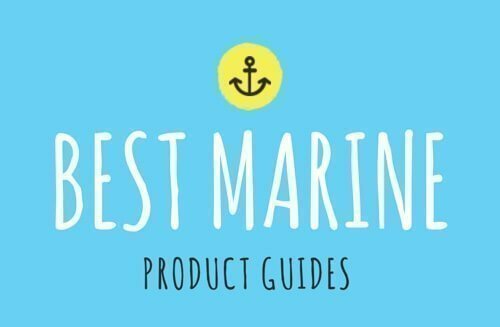 Ensuring that it’s marine certified & waterproof will enhance its longevity so you don’t have to replace it for a long time. In order to install your subwoofer, you should follow these three steps. Build a subwoofer box in order to contain the sound and protect your speaker. You can do this by making your own one or by using an existing panel on your boat for this purpose. Either surface mount your subwoofer to prevent any wires from sticking out or use the mounting accessories provided with your speaker. You must make sure that it’s fitted securely but that it’s still easily accessible. Wire your subwoofer. You can either wire it in parallel or series which will impact the sound quality. Parallel will reduce impedance while series is easier to install. Once your speaker is wired you can power it up and begin using it. In order to power your subwoofer, you need to connect both the power and ground wires to a battery. This is different from a car subwoofer where only the power wire is connected to the battery and the ground wire is attached to a metal surface. The benefit is that this makes it easier to use a subwoofer on your boat. If you’re looking for a subwoofer that’s small and compact, then the Bazooka is the one for you. Its power rating is lower than some models, which makes it ideal for easy listening while its low impedance allows this system to double your bass. Because of its Velcro reinforced mounting straps, it’s easy to install and its chrome plated finish gives it a sophisticated look that will add style to your boat. 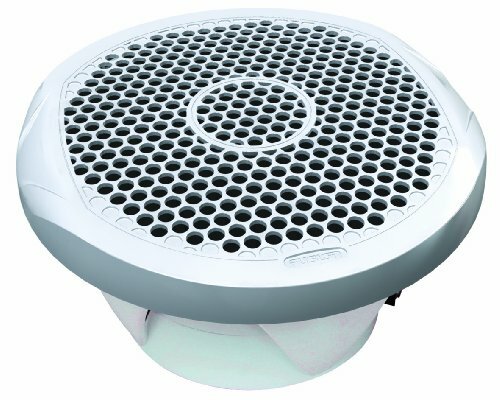 This speaker will back up your sound system and won’t be damaged by salt, fog or turbulent weather. 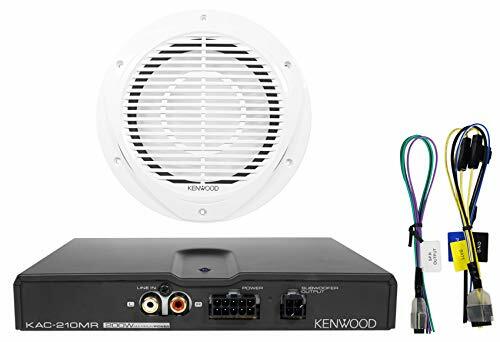 The Kenwood marine subwoofer may have a very low power rating but its impedance is so small that it’s capable of immense volume. This package also includes a Kenwood amplifier so your bass and sound needs are sorted. On top of this, it’s easy to install and it’s suitable for a small boat or pontoon. The sound quality is crisp & clear and it’s also so light that you don’t have to worry about any long term damage to the integral structure of your boat. For a subwoofer and amplifier combination, it’s highly affordable. When it comes to power, there are few subwoofers like the Rockville that can rock your boat. This device’s power rating goes into the thousands, giving you immense bass that you can feel when you listen to it. Even though the impedance may be a bit high, the 100 Oz magnet is larger than other models on the market, which means it can handle any type of noise. Not only is it powerful, but its elegant design is durable and waterproof so it can handle a great deal of wear & tear. Even if you jump on it, it won’t break and will still sound impressive. Once you’re on the water, it’s important that your subwoofer is durable and can withstand the elements. The Alpine subwoofer withstands the worst weather conditions so it’ll be reliable whether you’re out on a sunny day or if there’s a storm brewing. Even the hidden screw grille is resistant against salt corrosion so you never need to be concerned with humidity or fog. Along with its durability, this subwoofer also has a high power rating so you’ll be guaranteed full bass. It takes a lot to damage this speaker and you’ll have peak sound quality, making it one of the best models available. It might be a bit pricey, but its high standard makes this cost worthwhile. The Fusion subwoofer holds the True Marine Standard badge meaning that it’s undergone various degrees of testing to ensure it will withstand different weather conditions. As a result, this product is water resistant and will still maintain high quality even if exposed to salt or fog. Its decent power rating means that it’s capable of acceptable bass while not being overpowering so you can enjoy your music experience. Because it’s relatively affordable, it makes an ideal system for your boat without breaking the budget. 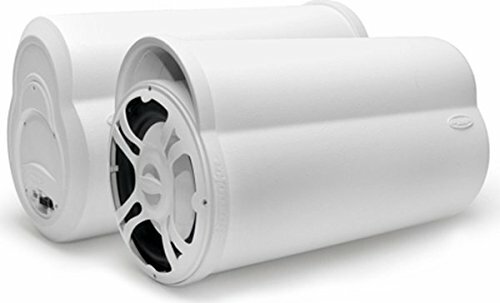 With any of these subwoofers, your music will be heard across a great area on open waters. It’s a fun way to enhance your parties and lose yourself in the music. Subwoofers are easy to install and you can even find decent ones for affordable prices. What’s holding you back?